Congratulations to Vivek Hallegere Murthy, MD, MBA, the 19th #SurgeonGeneral of the U.S.! 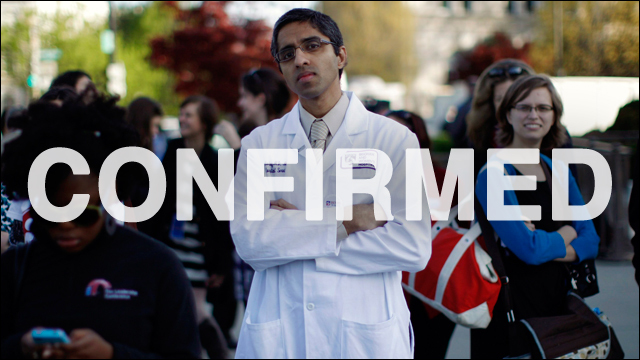 I applaud the Senate for confirming Vivek Murthy to be our country's next Surgeon General. As ‘America's Doctor,' Vivek will hit the ground running to make sure every American has the information they need to keep themselves and their families safe. He'll bring his lifetime of experience promoting public health to bear on priorities ranging from stopping new diseases to helping our kids grow up healthy and strong. Vivek will also help us build on the progress we've made combatting Ebola, both in our country and at its source. Combined with the crucial support for fighting Ebola included in the bill to fund our government next year, Vivek's confirmation makes us better positioned to save lives around the world and protect the American people here at home.